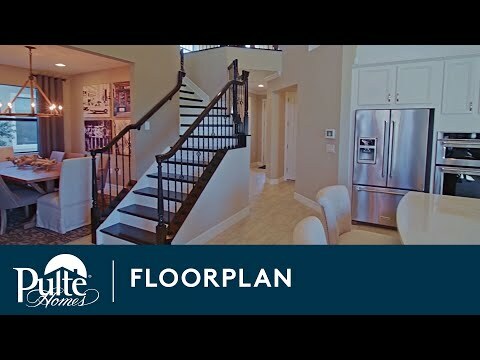 The two-story Clermont is a Life Tested® floor plan with features built for family living. A walk-in pantry allows for plenty of storage, and the island kitchen with eat-in bartop is perfect for breakfast on the go. Versatility is endless with the two first floor flex spaces, which can be used as a formal dining room, or can be converted into an additional bedroom and bath or an office. The Owner’s Suite and bath allow for privacy and relaxation with dual sinks and walk-in shower. Step inside Clermont to see the Life-Tested Home Designs® with more usable space where you want it most. So you live the way you want to live. The Clermont stands out for its flexible living spaces, open flow-through living concept, and rounded staircase. Granite countertops and tile floors in the kitchen and Pulte Planning Center® are standard features with long-lasting durability. Additional bedroom space is available on the first and second floor in the flexible living space or in lieu of unfinished storage near the game room. The two-story Clermont is a Life Tested® floor plan with features built for family living. A walk-in pantry allows for plenty of storage, and the kitchen island is perfect for a breakfast bar top. The Owner’s Suite allow for privacy and relaxation.